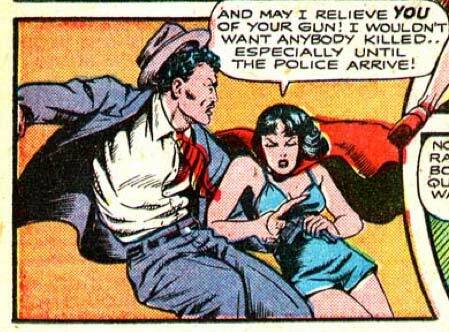 Is Phantom Lady only wearing a dress and a cape? I may have to recommend this as the least imaginative superhero costume ever. Actually, she’s kind of hot — check out this cover. It’s more of a split halter-top affair with some nifty slippers. As usual, I don’t get how no one recognizes her, since she doesn’t wear a mask or hood or anything as a disguise, and her dad’s a Senator. But my guess is, onlookers (at least the male ones) rarely make it up to her face. I stand corrected. Liefeld needs to take notes from this on how to draw women. So when the police arrive … it’s killing time?